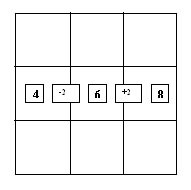 Magic squares are learning games which are arrangements of numbers in a way that their sum in any direction adds up to the same number - the magic number. This is a learning game. Do you shout at your children when they aggravate you with their stubborness? 1. 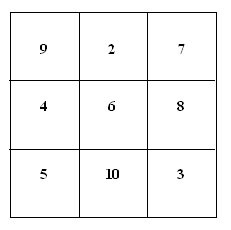 This puzzle or learning game uses a 3x3 matrix like the one given in the figure below. 2. 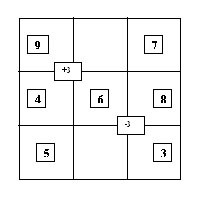 The puzzle or learning game is to distribute the sequence of any 9 natural consecutive numbers in the 9 cells of the 3x3 matrix. The distribution is done in such a way that the sum in any direction is the same magic number. 3. Divide 18 by 3. You get the quotient '6'. 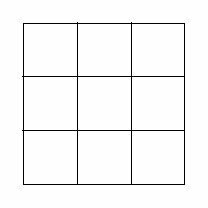 Put 6 in the central cell of the 3x3 matrix. 4. To get the numbers in the central row, i.e. to the right and the left of 6, add 2 to 6 and subtract 2 from 6 respectively. The result is represented in the picture. 5. The next step is to find the numbers on the left diagonal. Add 1 to 6 and subtract 1 from 6 to get the numbers on the right and left of 6 respectively on the left diagonal. 6. For the numbers on the right diagonal: add 3 to 6 to get the number on the left of 6; and subtract 3 from 6 to get the number on the right of 6. 7. For the numbers above and below 6: subtract 4 from 6 to get the number above 6; add 4 to 6 to get the number below 6. 8. 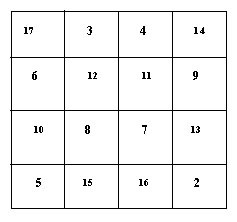 Now that you have all the numbers distributed in the 3x3 matrix, check whether the numbers in any direction add up to 18. 10. Play this puzzle with friends or students. 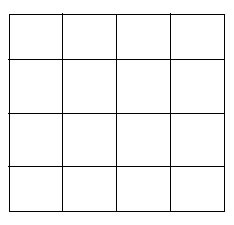 For instance for the magic number of 18, draw a 3x3 matrix. Ask your friends to arrange the numbers from 2 - 10 in the 9 cells of the matrix to get the sum of 18 in any direction. 1. 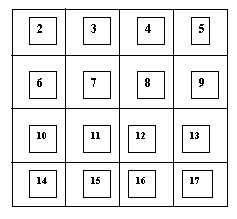 This magic square uses a 4x4 matrix with 16 cells. 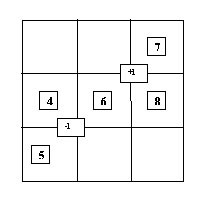 The puzzle is to arrange any 16 consequent natural numbers in the cells of the 4x4 matrix so that the sum in any direction is the same. 2. Let's work with the set of natural numbers from 2 to 17. The magic number is 38. 3. 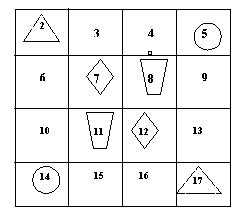 First arrange the sixteen numbers from 2-17 in order as shown in the figure. 4. Now swap the numbers enclosed in the same symbol, as shown in the two figures below. 5. Once the numbers have been swapped, check the sum of the numbers in any direction. The magic square works again! 6. 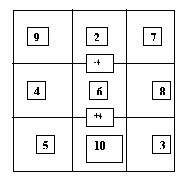 Construct other such magic squares and pose the puzzle to your friends. To know more about experiential learning and how to design experiential trainings contact us. Also get a monthly e-zine 'Stories for EL' free for stories, training games and activities that you can use to emphasise experiential learning. Stories, experiences and their lessons are easily remembered. They can also be used to communicate a concept effectively. They add the 'aha' or 'Eureka' or 'got it' factor to presentations and lectures. They are great tools to use in debriefs of training games and learning games, to drive home a crucial point. Fill in the form below and subscribe to the free learning game e-zine. I promise to use it only to send you Stories for EL.